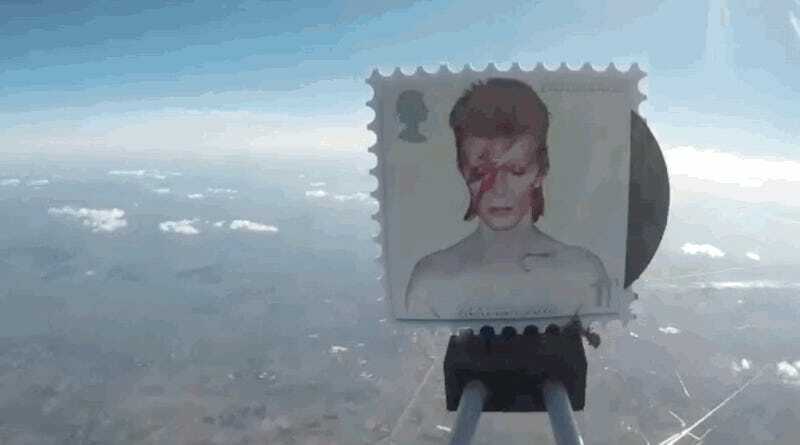 Well, this is both charming and baffling: As a tribute to David Bowie, the U.K.’s Royal Mail launched 52 sets of their commemorative David Bowie stamps into the sky. The stunt is, of course, inspired by Bowie’s 1976 acclaimed scifi movie The Man Who Fell to Earth. The stamps were attached to balloons yesterday—even better, they attached cameras to the stamps (you know, just like Bowie’s character in that movie). When the balloons burst, the stamps began hurtling towards the ground. The Royal Mail’s contest website plays the video taken by the stamp cameras. Watching too long may trigger your motion sickness, by the way. If you correctly guess where one of the sets landed, you’re entered into a drawing where the prize is one of the stratospheric sets. The contest ends March 26, although if you do guess where one of the stamps has landed, one might think you’d have a better chance of acquiring one by driving out there and finding it rather than relying on the drawing. At any rate, you can read the typically intense rules here. Meanwhile, I’ll be doing some back of the envelope calculations about how fast stamps attached to cameras can go in free fall.